Our product range includes a wide range of stair chair (esc 100). 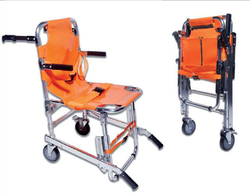 Stair Chair is mainly used in an ambulance where we cannot use an emergency stretcher. As it occupies less space and easily suspended in an ambulance. It has the facility of lifter rod.